I just don't feel like re-writing this post! This one was not planned. I've had this food processor for I don't know how many years. It was a gift from my Granny. And she is dead 17 years. So that gives you an idea. It's not like I use it every day. For years, it was only used once a year to make bread stuffing for our turkey. But more recently we used it for baking and cooking. Today, I was making raw chocolate brownies. And the motor died. So we had to take a quick trip to the shops to get a new one. 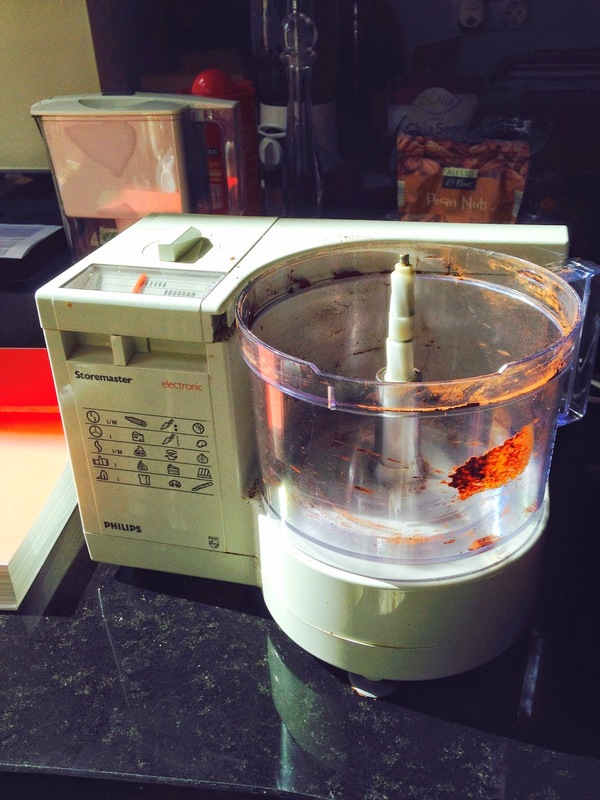 Bye bye, my dear old food processor! Definitely feeling more inspired now, aren't I? Not as much flow or movement as my other sketch, but still, I'll keep on practising. Inspired by a photo in a Sunday paper magazine. Beautiful flip-flops from Baros Maldives - but they are too big for me. Charity shop bag? Old mop. In the bin. I used a fairly boring page, black and gold. I applied red acrylic paint with a bubbly stencil (from ArtistCellar). I didn't take the Week 12 challenge too literally. No actual doodles. But I did place my main motif in the centre! If Danny Gregory can digress from the assignment, so can I! Instead of doodles, I went for stencil marks, from my favourite Japanese stencil set (I can't remember where I got those now - I will need to go through my old posts to find it, but dinner is nearly ready and it will have to wait - Here we are: it's from ArtistCellar). The border flowers were done using a border stencil I made myself using a punch from Lidl. And the sentiment is from The Little Book of Calm. It would have looked better without the tree. You live and learn - or maybe not? I'm really not sure this deserves to be on these pages, but there is something I like about it all the same, so why not? I had so much fun with these. I had come across this video on GelliArts' facebook page about using stencils with acrylic paint and a make-up sponge. Initially, I just wanted to try my dragonfly stencil on a scrap of Gelli print for a DLP project I had in mind. I happened to pick a "failed" round print (failed for being too boring - not a huge sin in itself, but for every glorious print, there is one that is just not quite as exciting. Or you could say that there are prints just waiting for further ideas from me). It was a green round print, and I used pale blue paint. It was lovely, but BB suggested brighter colours. I tend to favour subtle contrasts and muted colours, whereas he likes bold and bright. I wasn't convinced, but I decided to give it a go anyway. It's a while since you've heard me talk about baking. But that doesn't mean I wasn't beavering away in the background! Well, actually, I hadn't done much since Christmas, between colds and broken foot. But now that I'm on my feet again, I've baked biscuits (Aine McAteer's glorious chocolate chip cookies) and banana bread (Avoca, yummy, if a little sweet). But it was a while since I had baked a chocolate cake (or even brownies). This one is from a new book "A modern way to eat" by Anna Jones. They're all vegetarian recipes, and this cake boasts that it's actually good for you. With ground almonds, almond milk, banana, spelt flour, maple syrup, coconut oil and chocolate of course, what's not to love? It didn't quite rise as much as I thought it would. I took 2 tsp of baking powder to mean level teaspoons, not heaped. But I think I'll go for heaped next time, as the cake was supposed to be thicker so I could cut it in two and add a layer of (healthy) icing. But still, it is very rich and very tasty. Worth investigating further. Definitely. I know I know - I was giving out about the Documented Life Project - but then I have to acknowledge how much it's helped me develop my confidence in my own skills. And how great it is at banishing the fear of the blank page. And how it is non-threatening - "I'm not really painting anything that will be framed, so I can let myself go and explore without letting the little voice in my head tell me it's not good enough". Actually, isn't all successful art about fighting the little voice in our heads? I wonder do professional artists have the little voice in their heads too? Anyways, all that to say that I went back to Week 11 and borders and explored the theme further. I used one of my Gelli-print/brayer backgrounds, then I glued one of my echinacea prints. I was hoping to find more inspiration or tips in this year's DLP, but I have to say it feels like more of the same, without the fun. Oh but what to do? I had such fun with the 2014 DLP. Maybe I should go back to the journal format, rather than trying to be too arty? Or should I do the 2014 challenges all over again? I've looked around for another arty challenge but I haven't found anything that appealed to me (But I'm open to suggestions). The Bible art challenges are not for me! I did find a sketchbook challenge but I am so far behind - it started in 2011. I came across it four years too late, so I think it will be hard to motivate myself to follow it! I think I should plan my pages around a central feature, either a drawing/painting, or some text (a list maybe? I love ToDo lists. Or a Gratitude list. Or a list of things I'm reading, watching, listening, planning.). Because this organic format doesn't work for me. Productive art day yesterday. Why can't all days be like that? Oh I do love Boden! Old beauty samples that I know I won't use. Gone! Have you noticed that I'm choosing smaller and smaller items as the days go by? Another 13 days to go - I really don't know what I'm going to pick next.